Stoke have signed winger Peter Kopteff on a free transfer. The Championship club fought off competition from teams in Europe to seal a two-and-a-half year deal for the 26-year-old Finland international. Kopteff, was with Norwegian side Viking Stavanger, but his contract was about to come to an end. "I'm delighted to be here. The club has ambitions of reaching the Premiership and hopefully I can be part of that," Kopteff told the club website. 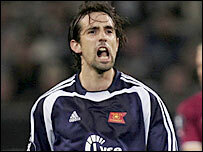 Kopteff has won 37 caps for Finland and has played in the Uefa Cup with Viking Stavanger. He was part of the side that knocked Chelsea out in the Uefa Cup first round in 2002.